It is one of our private activities in Cairo that permits you to wander most its famous landmarks. First you will enjoy a fascinating presentation to each of the three pyramids of Giza: Cheops, Khafre & Menakaure. 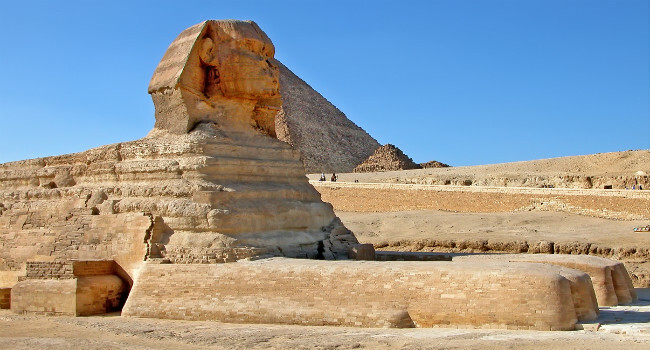 You will also get free time to enter one of these pyramids then drive to the other side of the plateau to wander the Sphinx, the vague symbol of ancient Egypt. It is possible to visit the Solar Boat Museum where lies the well conserved commemorative boat of Khufu. Continue to Cairo famed Egyptian Museum of antiquities that hosts over 165,000 of Egyptian artifacts, but the invaluable treasures of King Tutankhamun are the best part including the 6 gilded coffins and the fabulous death mask. Your guide will lead you to the museum top pieces before you enjoy free time strolling at leisure. Before returning to hotel you will visit the Papyrus Institute to get a presentation about this famous artwork.